Leftover Rice Cutlets are crispy outside and soft inside. Leftover Rice Cutlets tast so delicious and no onion no garlic too. Leftover Rice Cutlets are healthy too as it is loaded with veggies like carrot, potato capsicum, sweet corn and you could also make this with few drops of oil by just using appe pan. 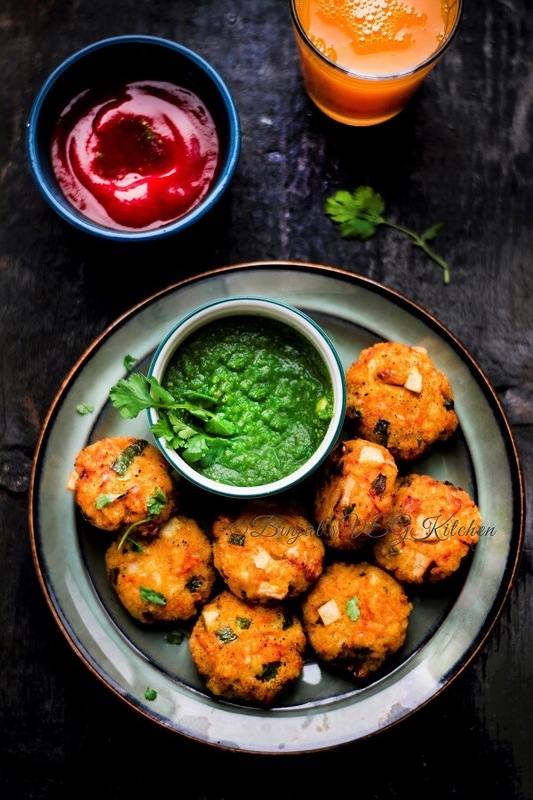 Leftover rice cutlets are great as an appetizer or snack for any get-together. Usually in our Indian household we use leftover rice to make fried rice, curd rice, etc… but today I used leftover rice in a different way and made deliciously tasty cutlets. Craving for sabudana wada, this cutlet gives you similar taste like sabudana wada, it is so quick and very easy. If you don’t have leftover rice you can use freshly cooked rice too. So here I am with a quick and smart recipe of Leftover Rice Cutlets’ that will get your kids munching away the leftover rice. Enjoy these crispy cutlets with a sprinkling of chaat masala and serve it with chutney and ketchup. 1. Take a mixing bowl. Add cooked rice, potato, grated carrot, ginger-green chili paste, chopped capsicum and sweet corn in it. 2. Now add amchoor powder, red chili powder, garam masala, turmeric powder, salt, sugar and mix it with spoon. 3. Add corn flour and mix it well with your hand, add more corn flour if mixture is moist. 4. Now make small lemon size ball, flatten it between your hand palm and make round shaped cutlets/tikki. 5. Use same process for remaining mixture and make more cutlets. 6. Heat oil in a kadhai/deep pan. Once oil heat enough, place 2-3 tikkis in hot oil carefully and fry it on medium flame till all side becomes golden brown. • If you rice is dry and its troubling with binding, then add all ingredients into the food processer and blend it for few seconds and then make cutlets. • Apply little oil on your hand palm to make cutlet balls, so it won’t stick to your hands. • You can add grated cheese into the mixture for cheesy cutlets. • If you don’t like fried food, then you can make it into the appe pan using few drops of oil. Take a mixing bowl. Add cooked rice, potato, grated carrot, ginger-green chili paste, chopped capsicum and sweet corn in it. Now add amchoor powder, red chili powder, garam masala, turmeric powder, salt, sugar and mix it with spoon. Add corn flour and mix it well with your hand, add more corn flour if mixture is moist. Heat oil in a kadhai/deep pan. Once oil heat enough, place 2-3 tikkis in hot oil carefully and fry it on medium flame till all side becomes golden brown. So good Binjal! They look so appetising. Literally mouthwatering!